Download Hour1 Download Hour2 At the recent demonstrations in Philadelphia, a protester held a sign, which read: "The Greatest Threat to Democracy is the Notion that it has Already Been Achieved". On this week's program we'll hear from a number of people grappling with political myths and realities in America. 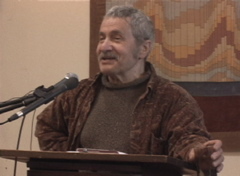 In an unusually personal presentation, Michael Parenti, talks about his journey from street gang kid to activist intellectual, and about his book "Land of Idols". A striking Bell Atlantic worker from Geneva, talks about the reasons for the strike; protesters in solidarity with the jailed activists in Philadelphia, demonstrate in Ithaca; and former Dead Kennedys frontman Jello Biafra talks about activism, American political realities, and the anti-globalization movement. This page was last modified on 28 July 2013, at 21:18. This page has been accessed 4,968 times.